What type of player are you looking to scout? When managing in lower league or non league football, the types of players you are likely to be signing are free transfers or players on loan. Unless you are very lucky and do have some money to spend on transfers. When managing a lower league team, I would recommend just looking for players with good current ability, this will be the quickest way to make sure you are being promoted through the leagues as quickly as possible. 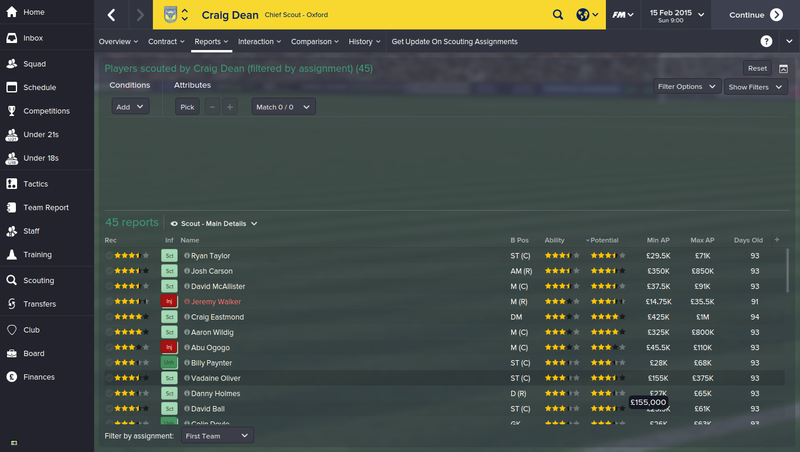 When you are managing a lower league team on football manager 2015 scouting can be tough, you will only be allowed to have about 3-4 scouts and your scouting range will be limited to the nation or region you are managing in. This is how I would set scouts up, if I only had 3. Scout 1: This scout would be searching for players in the league that I am playing in, for example, I would set this scout up to be looking for players who are good enough for league 2. At the end of the season, when the league is finished, this scout would be searching for free transfers or loans (free transfers would be better!). Scout 2: During the summer and right up to the end of the January transfer window this scout will be looking for free transfers and loan players. After the January transfer window is shut, this scout will be searching for players who's contract will be expiring. Scout 3: This scout will be doing the same as scout 2, however they need to be doing the opposite of scout 2. 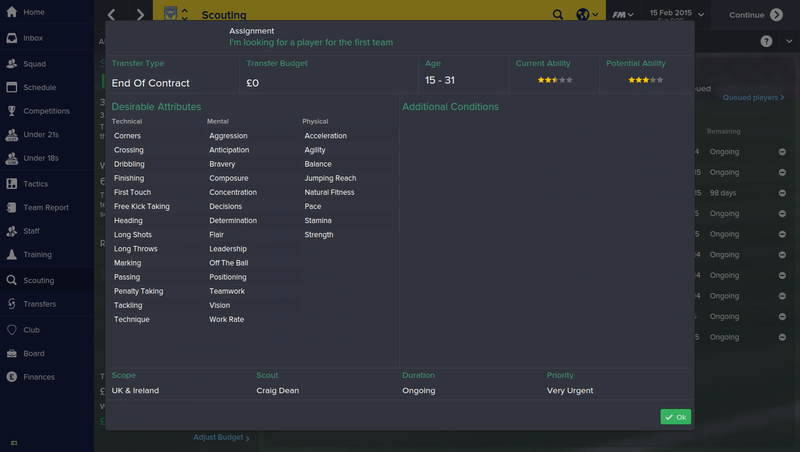 If scout 2 is looking for free transfers, then scout 3 will be looking for loan players. Again when the January window is shut, this scout will be looking for players who's contract is expiring. How does this scouting set up help you? This set up will give you a good rotation of players, you will constantly be looking for loans, frees and players who's contracts are expiring. The scout who is looking for players in your league, will find players who are proven in your league and when searching for players who's contracts are expiring, this will allow you to find players who should be good enough for your team. Remember we are only interested in finding players with good currently ability, don't focus on potential when managing a non league team.